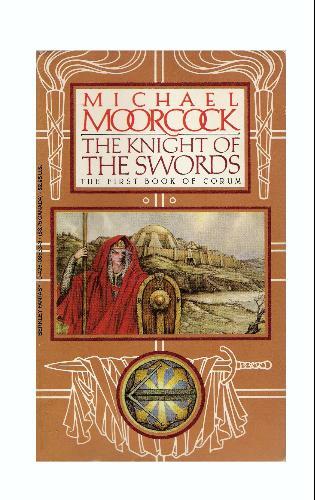 I finished the three books of Michael Moorcock’s Swords Trilogy, featuring Corum. They’re fast reads, but I found a little unengaging. I’m not sure that Moorcock was all that into Corum. Or rather, he tries for a more high fantasy tone that just doesn’t fit him – or what one wants from one of his books. There is a cool bit of magic, where Corum, who has had his left hand and eye severed and stabbed with a burning poker, respectively, has them replaced by the hand and eye of two alien gods, brothers. With the eye, he can see into a sort of hell populated by the last group of people he has killed and the hand can summon them to fight him (giving him a new group of hell soldiers to fight for him in the future). That’s pretty cool, I think we can all agree. But overall, Corum is a little dull and doesn’t seem to be all that badass of a warrior, not compared to other Moorcock fantasy creations. I seem to recall that the second Corum trilogy, the Chronicles of Corum, was a lot darker. Taking place in a dying world and generally pretty fatalistic. Sounds a little more interesting, though I don’t think I’ll be rereading it anytime soon. Maybe an Elric novel… Sailor on the Seas of Fate was he first one of those I read and always a favorite. And even if Elric’s three dimensionality and moral ambiguity was always a little overstated, he had a sentient sword would sometimes kill his friends without asking and drain their souls. And it would do this a lot more often than Corum dragged his soldiers from hell out to fight and, really, these aren’t things you should skimp on.